Wide differences in honesty and social capital between nearby localities have been measured in different parts of the world (Cohn et al. 2018, Knack et al. 1994). The reasons behind these differences, however, are not yet well understood. In a recent paper (Casari et al. 2018), we argue that migration may be one of these reasons. Besides a brain drain, migration can also cause a ‘civicness’ drain leading some localities into an ‘uncivicness’ trap. the uncivic, who instead pay taxes if and only if the expected penalty for not doing so is high enough. If the fraction of the uncivic is large and they free-ride, then the civic may decide to migrate elsewhere. At the same time, the uncivic may also consider migrating depending on how many of the civic they can free-ride. For both types, the decision to migrate hinges on the composition of types in the place of origin versus the place of destination. In addition, migration depends the beliefs about what will happen in the place of destination, where detection of uncivic behaviour may be more effective and where immigrants believed to be uncivic (independently of what they really are) may not be well accepted. The general hypothesis that we investigate is that initial differences in the degree of local civicness may induce a civicness drain in some places in the south while not in others. This is indeed the case in our data and we provide a theoretical explanation for what we find. Specifically, our conjecture is that if honest citizens are more likely than cheaters to emigrate from uncivic environments, this could lead to a ‘civicness drain’ in some uncivic locations, which may therefore be left in a trap difficult to surmount. We are of course aware that migration flows out of the South were – and still are – mainly driven by economic concerns, but, at the margin, civicness might play a role whose relevance we want to understand. To explore the validity of this conjecture, in the spring of 2015 we selected 33 senior classes in 11 high schools in Calabria (a southern Italian region ranking very low with respect to many proxies of social capital and characterised by a very high net overall emigration rate). A total of 671 students in these classes were asked to perform a series of assignments, which included rolling a die without being observed by others and knowing that reporting a six would imply a gain of €10 while any other number would bring nothing.1 This task was performed in conjunction with some questions measuring students’ competence in probability calculus. An innovative aspect of our experimental design consisted in informing students that what remained of the experimental budget after paying them for their unmonitored declarations would be donated to their school in the form of educational supplies. Students therefore knew that cheating would have taken away resources from the community, and this feature of our design captures an aspect of civicness that goes beyond mere honesty. The same experiment was then replicated in 2016 in Emilia-Romagna (a northern Italian region that ranks very high with respect to many proxies of social capital and with one of the highest net overall immigration rates), where 394 students in 23 senior classes in 13 high schools participated in the study. This setup allows us to classify students not reporting a six as ‘certainly civic’ (the ‘civic’ hereafter), while those reporting a six (the ‘uncivic’ hereafter) may have been ‘lucky civic’ or ‘truly uncivic’. Moreover, the experiment allows us to measure the average fraction of civic students in each high-school class, which constitutes the measure of ‘local civicness’ on which we focus our attention. Considering a population of students has an important advantage for our analysis – their school classmates can arguably be considered as one of the most relevant local communities with which they interact and for which an aggregate measure of civicness can be constructed with our experiment. Notes: The table reports statistics on individual and local civicness based on the die-roll task for Calabria and Emilia-Romagna. A student is defined as Civic if she did not report a six in the die-roll task. In the first row the unit of observation is a student. In the rest of the table the unit of observation is a class and local civicness is defined as the fraction of civic students in each class. The different unit of observation in the two parts of the table explains why the fraction of civic students in the first row differs from the mean of local civicness in the fourth row. 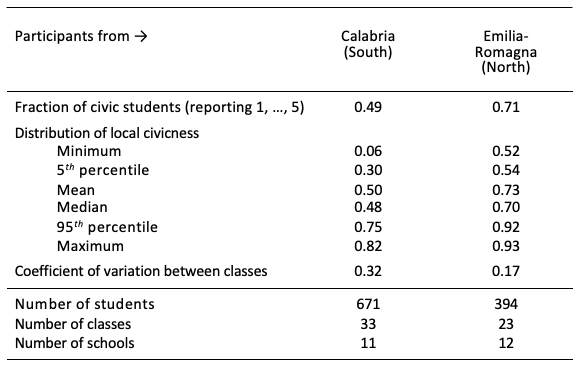 The evidence (see Table 1) indicates that the fraction of civic students is considerably lower in Calabria (49%) than in Emilia-Romagna (71%), which is in line with previous research and constitutes our Finding 1. There is, however, a substantial overlap between the supports of the two distributions, with significantly higher variability across classes in the South. While in Calabria local civicness (the fraction of students not reporting a six) ranges between 6% and 82%, in Emilia-Romagna it ranges from 52% to 93% (Finding 2). Since in our experiment there is no detection of cheating and no sanctioning, we treat this evidence as indicative of the distribution of the true propensity of subjects to be civic. Adapting to our setting the ‘lost wallet question’,3 we are also able to elicit Calabrian students’ beliefs about what the north thinks of southern local civicness. Our Finding 3 is that these (second-order) beliefs are positively correlated with local civicness (i.e. civicness in the class). In other words, students in classes with a higher civic fraction are more optimistic about the north's perception of their civicness. The possibility to link this information on civicness with information on migration decisions was offered by a follow-up interview in the autumn after graduation, in which students were asked about their college choices and more generally about whether they had decided to stay in Calabria or go elsewhere. Leaving Calabria to go to north was the choice of 32% of the interviewed students, in line with national statistics which also say that this choice turns into a long-term decision in the majority of cases. We are thus able to connect the migration decision of each student to her own civicness and to the average civicness of her high-school class, together with a large set of other indicators related to demographic characteristics, skills, risk preferences, time preferences, and family affluence that were generated by other parts of the data-collection effort. It is also important to note that our design allows us to study a population (senior high-school students) who are deciding to migrate for the first time. For this reason, our evidence speaks about how the initial conditions of local civicness may shape migration decisions. 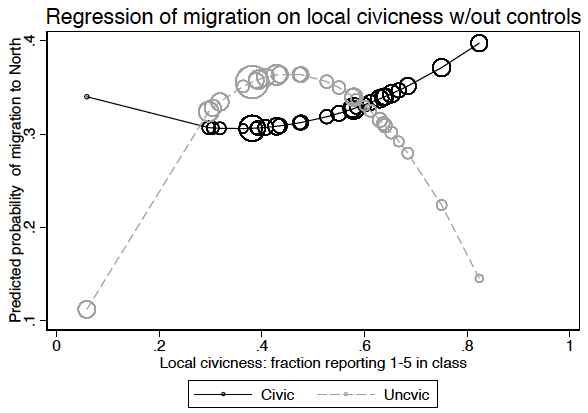 We find (see Figure 1) that civic students are more likely to emigrate when the local fraction of civic peers is either low or high compared to when it takes intermediate values (Finding 4). The opposite is true for uncivic students, who are more likely to stay when the local fraction of civic peers is either low or high, compared to when it takes intermediate values (Finding 5). 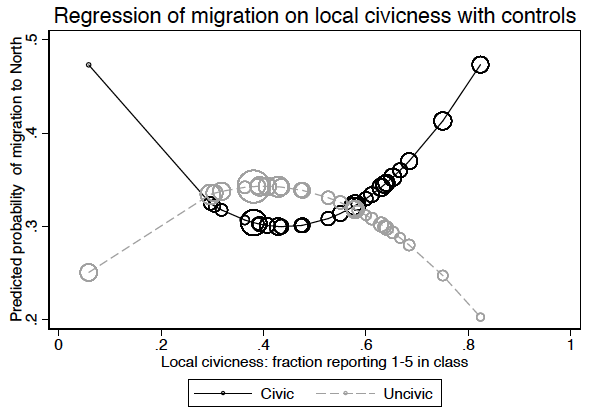 These patterns imply that a civicness drain is observed only at high and low levels of local civicness, while at intermediate levels the uncivic are more likely to emigrate than the civic (Finding 6). The theory we propose to explain these findings suggests that, abstracting from risk attitudes and beliefs, the general trend would be a civicness drain from the south to the north due to better enforcement of civic behaviour in the north, which makes migration more attractive for the civic. However, the general tendency for a civicness drain from the south is locally attenuated by the interaction between the different risk attitudes of the two types and their beliefs about what the north thinks of the civicness of a southern migrant (independently of the truth). The existence of an uncivicness drain at intermediate levels of local civicness hinges on the uncivic being more willing to take the risk of not being considered civic in the north. This characteristic (true in our data but not necessarily elsewhere) makes the uncivic more likely to migrate at these intermediate levels of local civicness at which uncertainty about what the north thinks of the south is the highest. Incidentally, while our focus is on heterogeneous patterns of civicness drain across localities within a region, we do not observe a civicness drain from the south in the aggregate. Notes: The figure plots the probability of observed migration to the north as predicted by our statistical analysis. All classes are used so that the analysis is based on 648 students (320 civic and 328 uncivic). The bottom panel reports results obtained when controlling for gender, intellectual ability, average intellectual ability in the class, risk seeking, impatience level, trust in others, family income, parental education, urban area, class size, the fractions of civic and uncivic classmates who declared the intention to migrate to the north at the time of the experiment, as well as for the identity of the helpers who ran the experiment. The novelty and main contribution of our analysis is to establish the possibility of a link between the initial conditions of local civicness and the civicness composition of migration flows. This link can explain how migration flows may have shaped the large heterogeneity of currently observed local civicness in different areas of the south (and possibly in other parts of the world). Such current heterogeneity may be, at least partly, the outcome of the heterogeneous mix of civic and uncivic migrants previously leaving each area, a mix that in turn may have been driven by the initial conditions of the distribution of local civicness. Exploring these dynamics comes next in our future research agenda. Abeler, J, D Nosenzo and C Raymond (2018), “Preferences for truth-telling”, Econometrica, forthcoming. Banfield, E C (1958), The moral basis of a backward society, The Free Press. Bigoni, M, S Bortolotti, M Casari, D Gambetta and F Pancotto (2016), “Amoral familism, social capital, or trust? The behavioural foundations of the Italian North-South divide”, Economic Journal 126: 1318-1341. Buonanno, P, R Durante, G Prarolo and P Vanin (2015), “Poor institutions, rich mines: Resource curse and the origins of the Sicilian mafia”, Economic Journal 125: 175-202. Casari, M, A Ichino, M Michaeli, M De Paola, G Marandola and Vincenzo Scoppa (2018), “Civicness drain”, CEPR Discussion Paper 13311. Cartocci, R (2007), Mappe del tesoro. Atlante del capitale sociale in Italia, Il Mulino. Cohn, A and M A Marechal (2018), “Laboratory measure of cheating predicts school misconduct”, Economic Journal 128: 2743-2754. Cohn, A, M A Marechal and C Zund (2018), “Civic honesty across the globe”, University of Zurich, mimeo. Dai, Z, F Galeotti and M Villeval (2016), “Cheating in the lab predicts fraud in the field: An experiment in public transportation”, Management Science 64(3): 983-1476. Fischbacher, U and F Foellmi-Heusi (2013), “Lies in disguise: An experimental study on cheating”, Journal of the European Economic Association 11(3): 525-547. Guiso, L, P Sapienza and L Zingales (2004), “The role of social capital in financial development”, American Economic Review 94(3): 526-556. Ichino, A and G Maggi (2000), “Work environment and individual background: explaining regional shirking differentials in a large Italian firm”, Quarterly Journal of Economics 115(3): 1057-1090. Knack, S (2001), “Trust, associational life and economic performance”, in Helliwell, J F (ed), The contribution of human and social capital to sustained economic growth and well-being. Quebec: Human Resources Development. Knack, S and P Keefer (1994), “Does social capital have an economic payoff? A cross-country investigation”, Quarterly Journal of Economics 112(4): 1251-1288. Putnam, R, R Leonardi and R Nanetti (1993), Making democracy work: Civic traditions in modern Italy, Princeton University Press. Sapienza, P, A Toldra-Simats and L Zingales (2013), “Understanding trust”, Economic Journal 123: 1313-1332. See, among others, Banfield (1958), Bigoni et al. (2016), Buonanno et al. (2015), Cartocci (2007), Guiso et al. (2004), Ichino and Maggi (2000) and Putnam et al. (1993). This experimental task has been used, for instance, by Abeler et al. (2018), Cohn et al. (2018), Dai et al. (2016) and Fischbacher et al. (2013). Dai et al. (2016) show that cheating in the die-roll task in the lab is a good predictor of free-riding on public transportation. See, for example, Cohn et al. (2018), Knack (2001) and Sapienza et al. (2013). This question refers to the hypothetical situation of losing a wallet and to the probability with which it would be returned. In our version of the question, Calabrian students were asked to imagine they had lost their wallet and to guess if the probability with which their wallet would be returned in a city in Calabria (Cosenza) was lower, equal or higher than in a city in Emilia-Romagna (Forli). They were further asked what a person born in Emilia-Romagna would answer to the same question.